Well, it is getting close for me to go back to work. I did manage to get a lift kit bracket set from Tad; I drove down to Tucson to get it. I have not been down there in a very long time. So long in fact, that I forgot how to get around, but I guess that is a good thing. What does that all mean? It means that Jerry has the other parts I need, so that next time I come home from work, I will get to pick up my goodies and come home to lift this thing! 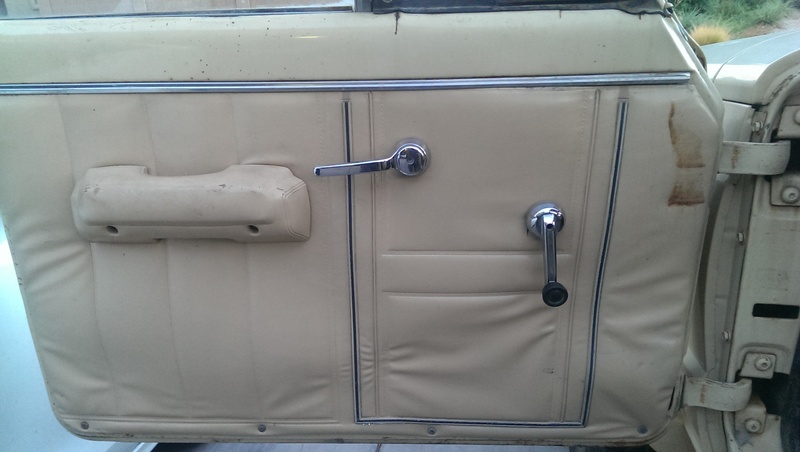 I have heard rumors that it might also be getting power windows/power door locks. Oh, just a little tidbit of information – I found out this used to be a military/government contract truck, check it out. For those of you that are unaware, AM General is the military sector of motor vehicles. I called my insurance and asked about putting classic car insurance on the truck. They told me that would not be a problem, that I could get full insurance for $113 a year. “We just need a few pictures of the truck” they said. Hmm. I am going to have to do something about that. I know I cannot send in pictures of the truck looking like this! It was very clear to us that we had much work to do. So, with my trusty little sidekick, Jaiden, we gutted the interior in preparations for making it all pretty. 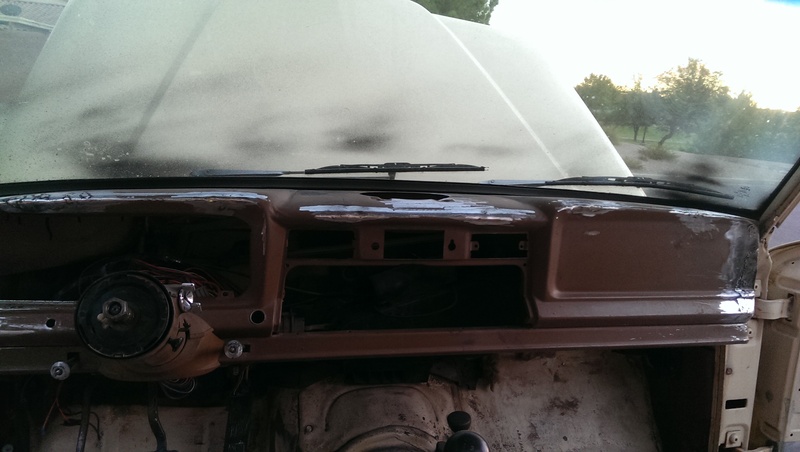 We pulled out the headliner, removed the crusty dash pad, and got rid of the old door panels. Just like on the infomercials! 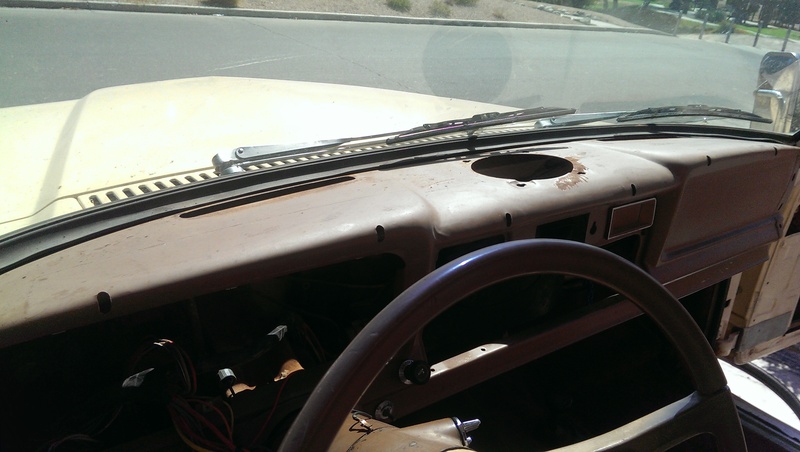 In just minutes, you can go from nasty old interior to brand new interior! Just spray on and let soak, wipe dry and viola! *and then you read the little itty bitty text that says it was all elapsed time, and that there was a whole crew of people cleaning, fixing, and replacing things. This was no magic potion. It took us a good five hours to get these doors to look this good. I have some old shelf backings that are made of sheet metal. 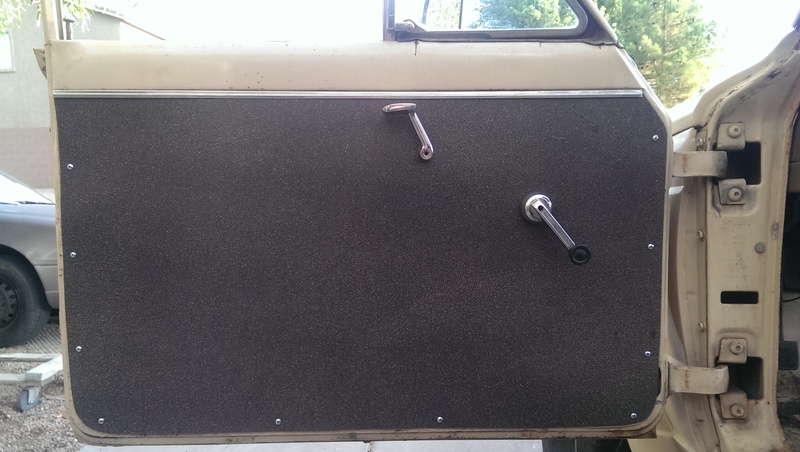 Tony and I used the old door panels as a template and cut those out to make the new ones. Then we sprayed Rustoleum Hammered black paint and followed it with a mist of Rustoleum American Accents stone. Tony and I got both sides done in this timeframe, but the other door looks quite the same, and it gets to be a bit redundant. The door handle is off a ’68 Fairlane that Chris and I took parts off while we were at the wrecking yard in Flagstaff. I started working the dash, too. I ripped off the pad and welded up the bolt holes to smooth it all out. It is okay, you can laugh at my crappy welds. The fact of the matter is that I was using flux core on a MIG welder trying to tack weld slots shut on sheet metal. Not the easiest thing to do. I did manage to fix it. It only took me about three days of chasing welds and burning holes, but I finally got it figured out. This picture was taken right after the first coat went on. This was a cover coat, so I needed something sort of thick. I turned to As Seen on TV: Flex Seal – it will transform and protect virtually everything! This is what I learned here. Had I just made my welds good, I could have used this stuff and it would have covered them perfectly. Instead I had to go around “fixing” everything and then grinding it down and fixing it again until I was forced to weld two soda cans together with a 110v MIG welder. Not fun. But, lesson learned. I was able to make it all work out, in the end. I still need to do something with that windshield, but otherwise, I think I have a decent interior. The outside also got a bit of attention over this period of time. 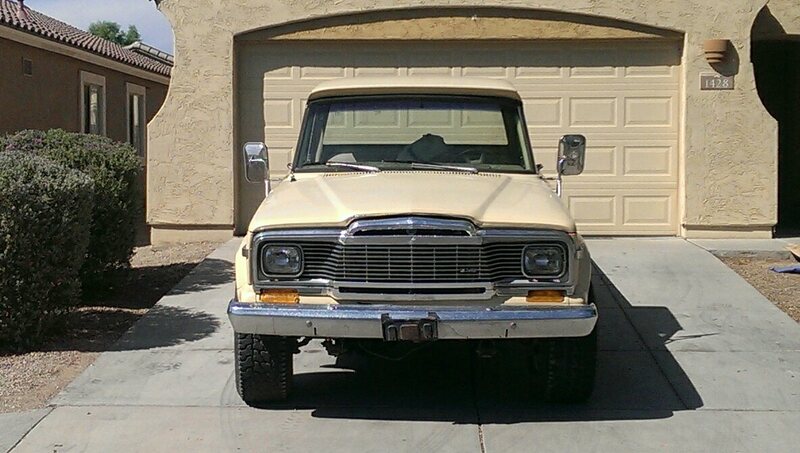 I was fortunate enough to have the original Pig Nose grille delivered with the truck. As much as I hate square lights on a Jeep, this was all about getting the truck ready for its photo op for the insurance company. That looks better! 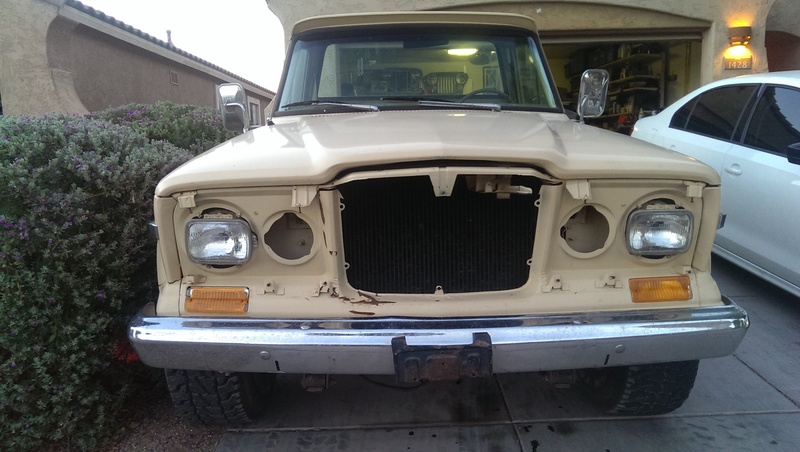 Sort of, it still has square headlights; that is something we will be changing very soon!